WASHINGTON, D.C.—USU public relations senior Natalie Curtis has been selected for a coveted scholarship for PR students. Winners of the Betsy Plank scholarship were presented at the annual awards ceremonies during the PRSSA 2010 National Conference in Washington, D.C., in October. • LISTEN to Utah Public Radio story on Natalie Curtis by fellow JCOM senior Landon Hemsley. Curtis received a check for $750 and a silver mug engraved with her name and the award, named for longtime “matriarch” of the national Public Relations Society of America Betsy Plank, who died in May. Candidates for the award were selected based on four criteria of academic achievement in public relations and overall studies, demonstrated leadership, practical experience and commitment to public relations. 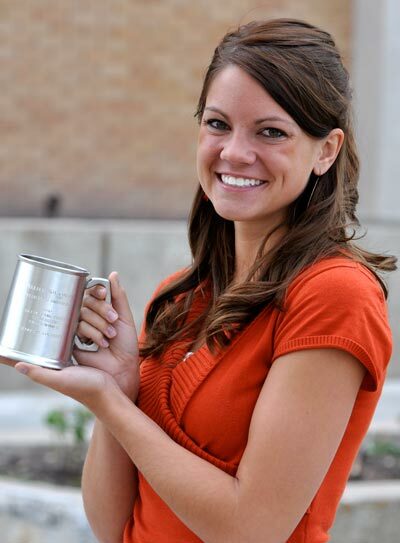 • Second big honor for Aggie PR students: Lewis named best PR student in Utah. She has also accepted a marketing job with Obelis European in Brussels, starting in June. Curtis has been a leader of the USU PRSSA chapter and helped create True Blue Communications, a student-run public relations agency in the JCOM department to serve clients and give PR and marketing students real-world experience beyond the classroom. “Our clients range from non-profit, to corporate, to campus groups, ” said Curtis, who manages True Blue teams and also works as part of the student agency’s Wellbeing Company team, which is providing a PR program for a pharmaceutical company in South Africa. “I enjoy being the director of True Blue to give students great opportunities, but I also enjoy being a part of the teams, actually doing the PR work,” she said. Parker, a PR lecturer in the JCOM department and faculty adviser to the student PRSSA chapter and the True Blue agency, says the inspiration works both ways. Curtis is “truly one of our top public relations students,” he said. “I’ve been impressed not only by Natalie’s abilities, but also by her willingness to go beyond what is expected of her,” Parker said. Curtis, who will graduate in May, works as a corporate PR and marketing assistant for Harris Research, Inc. in Logan, where she develops PR strategy, assists franchises with search engine marketing and produces national advertising. Her most recent project was assisting in the production of three national TV commercials. Way to go Natalie! You are such a rock star and totally deserving of national recognition.